The Tesla Model S has been the darling of auto reviewers. Specifically, reviewers love Elon Musk's modified personal Model S, which is all many of them have driven so far. 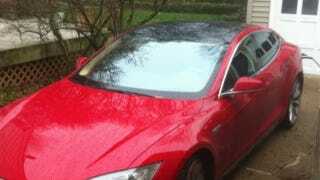 It looks like AutoWeek's Rory Carroll has a different Model S, and his attempt to charge the vehicle has left him stranded in his own driveway. Specifically, Carroll tweeted out that his Model S won't release its charger cable and, by doing so, won't let him drive. He also can't unplug the other end and put it in his trunk because the system won't let you move if the car is still plugged in (probably a smart idea). Carroll says he's called the Tesla service center three times and hasn't gotten a call back yet. Here's the exchange on Twitter with video of what happened. On the spectrum of potential problems this is fairly minor, compared to bricking it's just a temporary inconvenience. It's also possible Carroll doesn't understand how the system works and the charger isn't defective, but as a professional reviewer we're giving him the benefit of the doubt. Anyone who has a Tesla have a similar problem? Or another electric car with the same issue? How did you resolve it?